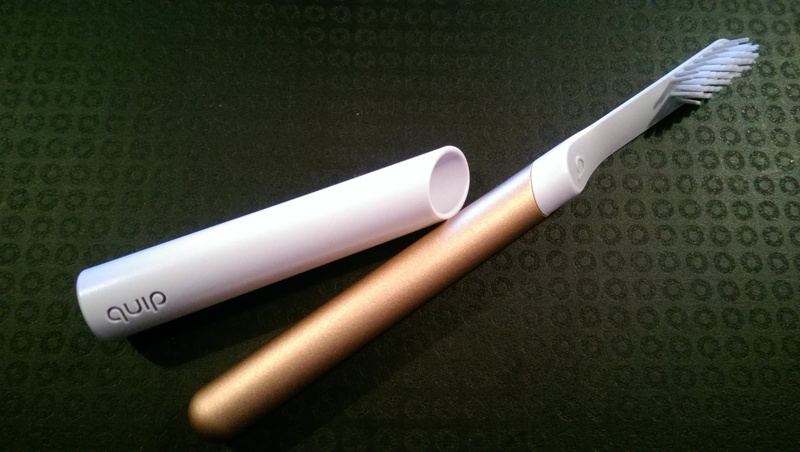 Quip – the iPhone of toothbrushes? I have always been a bit weird about electric toothbrushes, and until now have dodged them, despite repeated and less than subtle comments from my dentist. But I was offered a pretty decent offer for a Quip toothbrush – advertised as the iPhone of toothbrushes. You can pick your finish, and I went for a brushed metal finish in copper, it’s a very stylish toothbrush. It comes from the US so you have to wait a while, but every three months when it’s time to change the head, a new one will appear in the post. It’s rather fancy in appearance and has a sticky strip to mount it on the bathroom tiles. It runs off a AAA battery, so you can take it anywhere, unlike the kind that need charging all the time. My plan was $55 (approx £38) and the replacement heads are $5 – but if you sign up online now, your first head is free and if you register, you can get them free for a whole year – which is what I did. Bargain. I didn’t order the toothpaste as well, mostly because I am fussy about my minty freshness, but that is another option.